The three most important challenges facing the economy are the containment of the fiscal deficit, lessening the trade deficit and reducing the public debt: especially its foreign debt component. Unless there is significant progress in reducing these, the resultant economic instability would hamper sustained economic growth. Fiscal deficits increase the cost of living that lead to strikes with demands for higher wages and industrial unrest. Wage increases add to the costs of production and reduce export competitiveness. The depreciation of the currency to restore export competitiveness would lead to further inflation and increased hardships. Inflation causes severe hardships to lower wage earners pensioners and fixed income earners. Large fiscal deficits lead to borrowing and in turn to huge debt servicing costs. 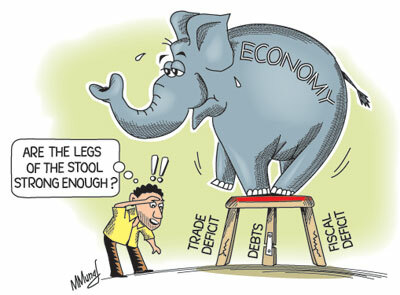 Sri Lanka’s huge accumulated debt is a result of persistent deficits over the years. The massive public debt servicing costs distort public expenditure priorities and hampers economic development. The target to bring down the fiscal deficit to 5.8 percent of GDP this year is difficult to achieve owing to the continuing high government expenditure, high debt servicing costs, losses of public enterprises and declining revenues. It is, however, important to cut government expenditure and reduce losses in public enterprises to achieve a lesser deficit. One of the disappointing features of recent fiscal performance has been the decline in the revenue to GDP ratio from an already low 14.3 to 13 percent last year. The collection of 15 percent of GDP as revenue should be the objective for this year. In the next few years government revenue should be enhanced to around 20 percent of GDP to achieve a fiscal deficit of 5 percent or less. Losses incurred by public enterprises are a huge fiscal burden. Reforms of these public enterprises to reduce losses provide a significant means of reducing expenditure. The Central Bank has argued this cogently in its Annual Report for 2012. “Improving the financial viability of state owned enterprises would be crucial towards strengthening macroeconomic stability and financial system stability. While agreeing that measures need to be taken to improve the operational efficiency of public enterprises, it is difficult to concede that revisions of energy prices are a step in the right direction. Reforms in the management of these public enterprises should be the priority and should precede price increases. The increase in electricity prices would increase the costs of living and the costs of industrial production. There has been a decrease in the public debt as a proportion of GDP in recent years. In 2002 the public debt was as much as 105 percent of GDP. In subsequent years it has been brought down as a proportion of GDP. In 2011 it was 78.5 percent of GDP. 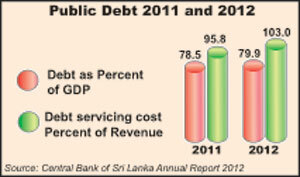 However in 2012 the debt to GDP ratio increased to 79.1 percent of GDP. Although the debt to GDP ratio declined till last year, the public debt increased substantially. The debt to GDP ratio declined owing to the GDP increasing and the appreciation of the rupee till 2012. (The appreciation of the rupee leads to a lowering of the ratio as the debt is in rupees, while a depreciation has the opposite effect). The debt to GDP ratio is an inadequate, even misleading, indicator of the country’s indebtedness. In 2012, the increase in debt resulted in an increase in the debt to GDP ratio to nearly 80 percent. This was due to increased borrowing, the depreciation of the currency, and the slower economic growth of last year. The debt servicing cost as a proportion of revenue is a better indicator of the crippling effect of the large public debt. In 2011, debt servicing payments absorbed 95.8 percent of revenue. In 2012 debt servicing costs were higher than the government revenue: 103 percent of government revenue. This means that government has to borrow for its other expenditures. This in turn increases the public debt. The foreign debt servicing costs absorbed 16.4 of earnings from exports and services, up from 11.1 percent in 2011. Since the large foreign debt is a continuing burden on the public finances and the balance of payments, it is important to take measures to reduce the foreign debt burden by generating a significant balance of payments surplus. This requires a reduction in the trade deficit. The government’s programme of infrastructure development such as roads, bridges and energy generation will contribute to economic development in the long run. However, in consideration of the country’s fiscal constraints, impact on debt, balance of payments difficulties and other priorities, it is important to reconsider the pace and priorities of investment expenditure. Good governance is essential to achieve the three vital economic goals and to promote an environment that is conducive to higher investment that is needed to spur economic growth. Higher economic growth, achieved by the right composition of output, could in turn lessen the fiscal deficit, reduce the trade gap and decrease public debt. What protection does a protestor holding a candle have?